“Have you talked to him about that?” I say. Tundra swan flocks, eastern bluebirds and brown-headed cowbirds suddenly appeared whenever a birder was near. Cowbirds are brood parasites. They don’t build nests. Instead, they lay their eggs in the nests of other birds. 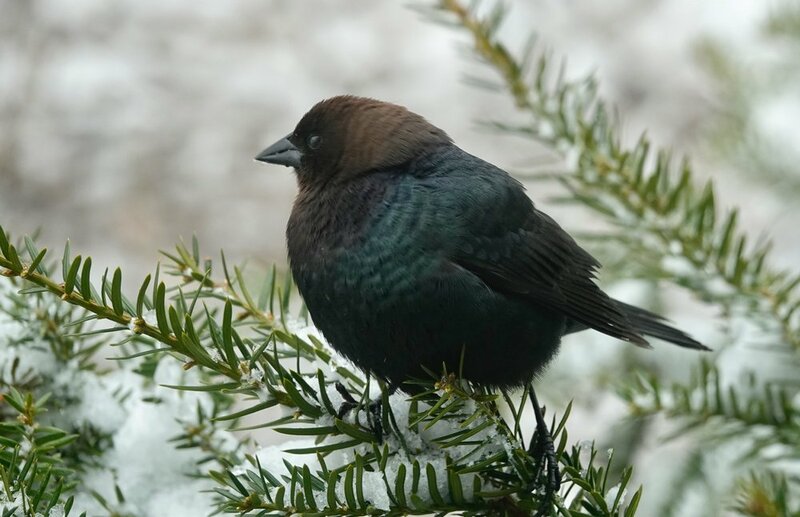 The host birds incubate cowbird eggs and raise the chicks, often to the detriment of their own offspring. Sandhill cranes rattled, trumpeted and bugled as they took flight. Opportunistic omnivores, their varied diet includes waste corn, small mammals, amphibians, insects, reptiles and snails. Northern harriers return when the snow leaves the fields. Once called a marsh hawk, it courses low over the ground while hunting small mammals, reptiles, amphibians, birds and insects. They locate some prey by sound. Pocket gopher mounds declare the frost is out of the ground. I browsed the seed selection in a store. I used to plant marigolds around the borders of vegetable gardens to discourage rabbits. I stopped when the eastern cottontails began eating marigolds. The Rice Soil and Water Conservation District selected Keith Radel of Faribault to receive the 2018 Wildlife Enhancement Award for Rice County. Keith volunteers with the Bluebird Recovery Program, checking and maintaining a bluebird trail consisting of 175 nest sites throughout the bluebird mating season, from April through August. Keith has fledged 13,148 bluebirds from those nest boxes over 30 years. He began with 25 boxes on a 5-acre patch of land. “If a bluebird had flown in, it would have hit a box,” recalled Keith. That year, those boxes had no nests, no eggs and no baby bluebirds. Keith added six boxes the nest year. He fledged eight bluebirds. Keith realized that the 5 acres should have had only two sites. If paired, that meant four boxes. He culled the herd of nest boxes to four and 81 birds were fledged. Keith learned that a young bluebird could fly up to 300 feet on its maiden flight. He gives a box two years to fledge birds. If it doesn’t, he moves it to another location. Keith mentioned Roger Strand, a most successful wood duck landlord, who mounts wood duck boxes on baffled poles in water. The baffles keep predators away. Roger keeps the boxes 16 feet away from trees to prevent squirrels from leaping onto the boxes. “Do owls eat fish?” Mike Kennedy of Winona told me that he’d had a barred owl pestering his bobber while Mike was fishing. Barred owls do catch and eat fish. The great horned owl and other owls will sometimes go fishing. “The seed in my bird feeders disappears so quickly. What’s going on?” My guess is that the birds are eating it. “How many baby robins live a year?” About one in four survive 12 months. “Where is the best place to put a bird feeder?” I have the best luck by putting a feeder outside. In the TV series “Mad Men,” a character said, “Nothing concentrates the mind like the prospect of being hanged at dawn.” This was a variation on a Samuel Johnson quote, “Depend upon it, sir, when a man knows he is to be hanged in a fortnight, it concentrates his mind wonderfully.” When putting up a feeder, concentrate your mind just enough to hang it in the best spot, which is some place where you’ll see it regularly without much effort. This stubborn structure near Belden, Nebraska, was once someone’s dream house. I hadn’t considered moving to Nebraska, but they might have named a town after me. That’s applying pressure to relocate. 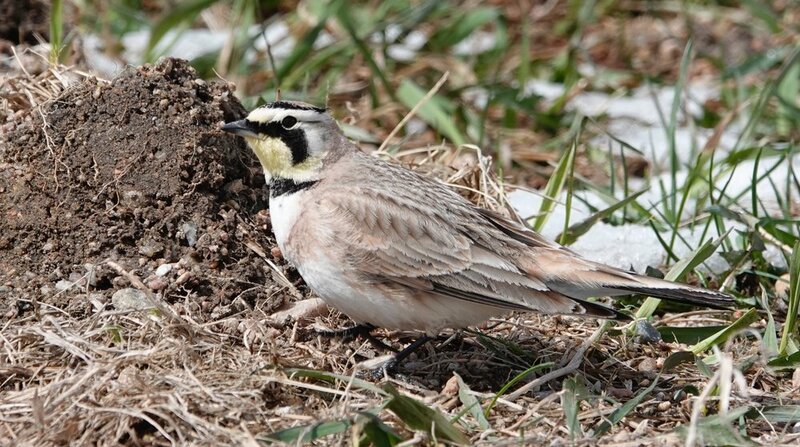 A horned lark homesteads bare ground.